When you need a durable and convenient household tool with timeless style, the ProtectoMat laminated cork mat is the solution. Made of natural cork and available in two rich patterns, the ProtectoMat is a stylish addition to your kitchen, dinner table or any room in your house. Drink coasters. 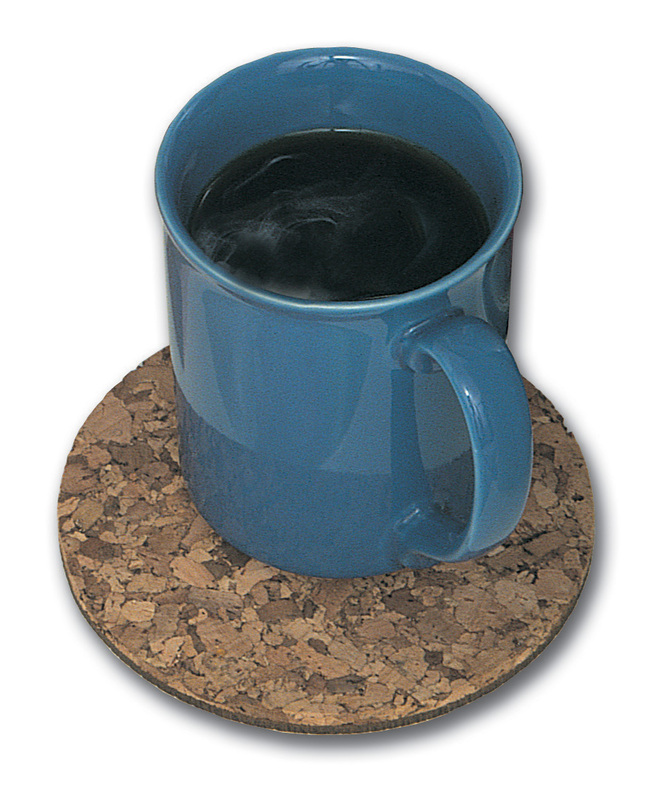 Place ProtectoMat cork coasters under wine glasses, coffee mugs and other beverages to protect glass, wood and counter tops from stains, rings and discoloration. Hot pads. Don’t let hot pots and plates burn your kitchen and dining surfaces. The ProtectoMat is available in sizes that are perfect to use under hot cooking and serving dishes. Placemats. 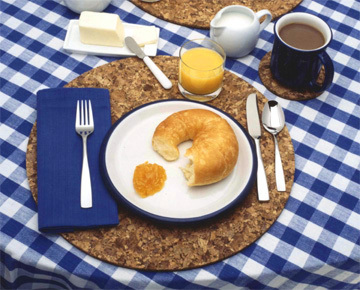 Easily washed in soap and hot water, the ProtectoMat is the ideal placemat for any meal. Put it under your plates to protect any indoor and outdoor table surface. Serving tray. With its beautiful texture and rich colors, the ProtectoMat makes a timeless presentation for drinks, appetizers, pizza and desserts. Condiment organizer. Why carry your condiments one at a time? Keep them together on a handy ProtectoMat that will allow you to take all of your condiments from the counter to the table in one trip. Under plants. 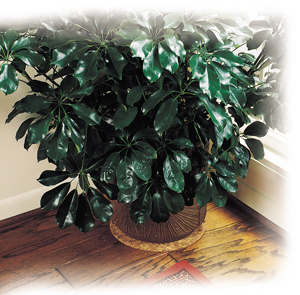 Don’t pay the price of water damage or scratches on your floor or furniture caused by houseplants. Keep your plants on ProtectoMats and keep your surfaces clean and dry. Under candles. Love the color and aroma of candles but hate the drippy mess? ProtectoMat lets you enjoy candles while protecting your furniture and floors from candle drips. Although your garden may be outside, you still have surfaces you want to protect. Patio furniture, cement, tile, decks or stone are susceptible to water stains, rings and rust. ProtectoMat comes in 21 different sizes to accommodate the smallest to the largest plant holders and pots. Under potted plants and flowers. Keep your patio or deck vibrant with flowers without worrying about water damage from over watered or leaking pots. The ProtectoMat keeps your outdoor surfaces clean, dry and pristine. On patio furniture. Dining or entertaining outside and don’t want to use breakables? Don’t forget to protect your patio furniture using ProtectoMats as coasters, trivets and placemats. And, with diameters up to 24”, the multi-use ProtectoMat is the perfect serving tray to carry everything you need from kitchen to table. Crafting activities and hobbies. Save your surfaces from drips, spills and cuts with ProtectoMats. Use rectangular or round ProtectoMats to protect surfaces under your projects, or use them as part of your projects. The dependability of your ProtectoMat makes it the ideal tool in commercial environments. From restaurants and catering to interior landscaping and laboratories, ProtectoMat is the versatile solution for hundreds of commercial applications. 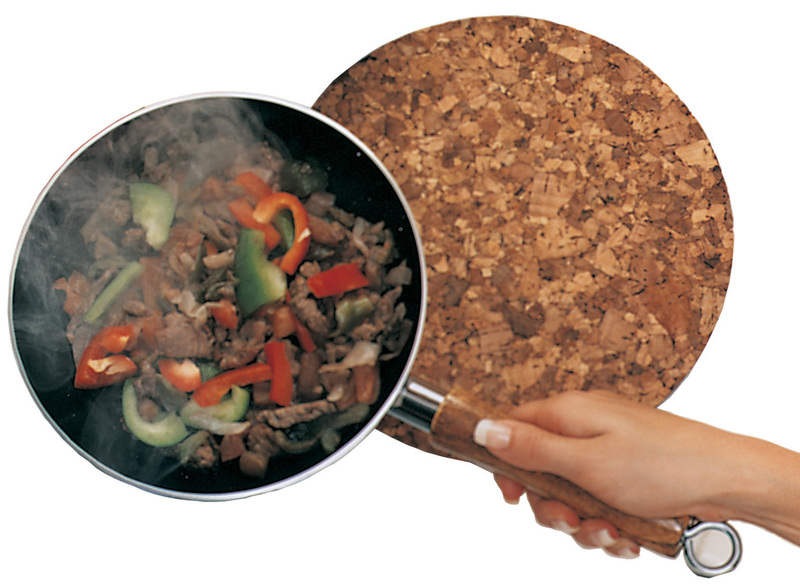 ProtectoMat’s unique cork makes it the perfect accompaniment to restaurant and catering applications. Used as trivet, beverage coaster or serving tray, the attractive ProtectoMat protects surfaces from heat and moisture. Under hot foods. The ProtectoMat is an attractive way to safely serve hot foods and protect restaurant counters and tables. Pizza Hut® has used the ProtectoMat under their pizzas for many years. Durable and easy to clean, the ProtectoMat is an essential serving tray or trivet. Under centerpieces. Ever feel uneasy placing a plant or floral arrangement on a white tablecloth? The ProtectoMat preserves the beauty of event decorations without being a distraction. Available in 21 sizes, you'll find the perfect sized ProtectoMat to fit under every centerpiece. Under beverages and pitchers. Don’t let sweating pitchers of water and other beverages ruin buffet tables, dining tabletops and linens. Made of quality cork, the ProtectoMat absorbs moisture condensation or spills, eliminating rings and stains. Carpet, wood or tile flooring. When working in a laboratory, protecting surfaces is a top priority. Using the ProtectoMat as a coaster for beakers, bottles and labware protects counter tops from spills and burns. Easy to clean and available in 21 circular and many square and rectangular sizes, the ProtectoMat is an essential lab tool. Few environments take as much wear and tear as schools. This makes the hard-working ProtectoMat the answer to protecting surfaces in classrooms, science labs and art rooms. 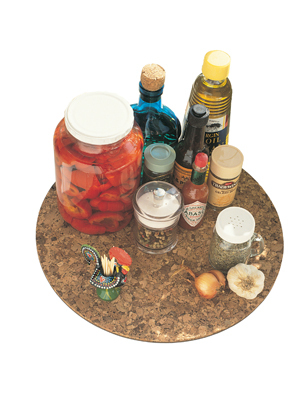 Use the ProtectoMat cork mats to make floors, countertops and desks last and last. It is always wise to check the surfaces beneath your plant containers periodically to ensure that conditions are normal. ProtectoMats do not always eliminate the need for a saucer under a plant container. 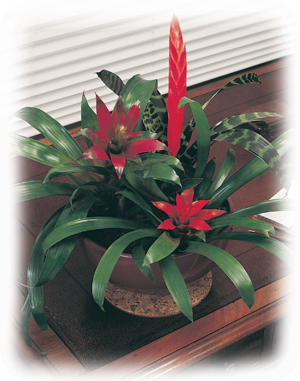 If the product is being used under potted plants with drain holes, avoid flooding by placing a saucer under the pot. Occasionally, excessive moisture build-up can soak the ProtectoMat beyond its ability to absorb. Heavy containers (i.e. terra cotta) or containers with invisible cracks can cause staining or moisture damage. Avoid this by elevating the container slightly above the mat to provide air circulation beneath the pot. For the occasional problem container, plantscape professionals often stack two ProtectoMats under the pot.